The Social Justice Committee seeks ways to promote justice and peace in the parish and ways the parish can become involved in social justice issues in society. Meets at 9:00 am on the first Tuesday of the month in the Parish Office Kitchen. Collects and delivers food to the Rainier Valley Food Bank. Hold a Bake Sale once a year to raise money for the Rainier Valley Food Bank. 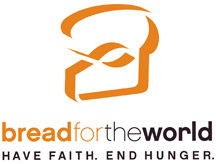 Organize the Bread for the World Letter writing campaign in the fall.